The timing couldn’t be more perfect as the TOM FORD Beauty Summer 2014 Collection is now available for pre-order along with a multitude of other wonderful TOM FORD handbags, footwear, eyewear and beauty products to choose from. Offer valid in stores 03/27-03/30/14. Some exclusions may apply; see your sales associate for details. 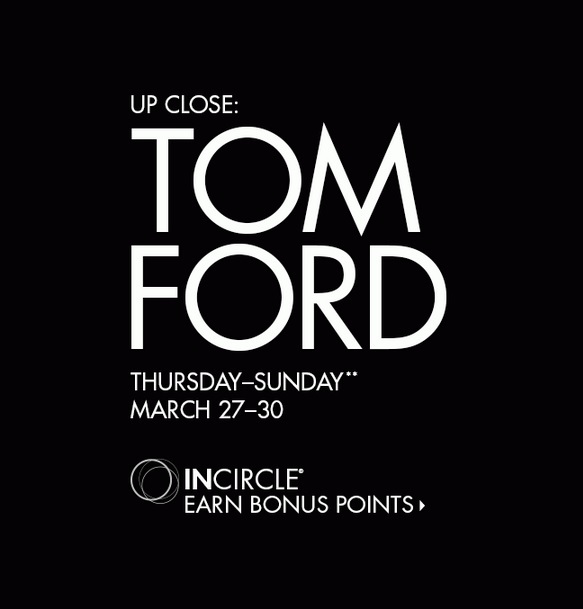 ONLINE: You will automatically earn InCircle bonus points on your Tom Ford purchase of $500 or more using your Neiman Marcus or Bergdorf Goodman credit card. Qualifying items will be designated on the site with an indication on their product page. Points are earned only on NM or BG credit card purchases after applicable discounts or gift card values have been applied. For International orders, once you have selected your items, call 010.972.556.6011 to speak with one of our international sales associates to complete your order. Tax, wedding registry, alterations, gift packaging, beauty salons, and gift card purchases are not eligible for InCircle points. Any offer that awards bonus points cannot be combined with other InCircle point offers. Offer not valid for catalogs, Bergdorf Goodman®, CUSP®, and Last Call®. This offer cannot be applied to previous purchases. Enrolled Platinum Card® and Centurion® members from American Express are not eligible for bonus-point opportunities. Returns will result in bonus point adjustments. Other exclusions may apply. Offer expires 03/30/14 at 11:59 PM CT.